Home / card / e-plus / movie / sm cinema / the avengers / e-PLUS: Movie-watching Made Easy! It was during the opening of the now-world-hit movie The Avengers that I was introduced to the newest innovation of SM Cinema to movie watching. Little do I know about this e-PLUS card thing that they just launched, I was happy that at the end of the day I was introduced to it and I'm actually planning to have one now. SM Cinema recently launched the e-PLUS (Entertainment, Privileges, Lifestyle, Upgrades, Surprises) Card, the first of its kind in the country that offers the convenience of having a reloadable card that works as a ticket to SM Cinemas exclusively and a rewards card that allows cardholders to earn points at the same time. e-PLUS will make movie watching more convenient and even more enjoyable as it loads up and get instant access to your favorite blockbusters. There's no need to fall in line - each cardholder may go straight to their theater of choice by just presenting their card. And aside from that, they get movie and promo updates regularly both via SMS and e-mail. The card also entitles them to seasonal offers, exclusive raffles, and discounts from partner establishments, and access to special events. Getting an e-PLUS card is so easy! One must fill out an application form obtainable at any E-PLUS booth or from the SM Cinema website www.smcinema.com. 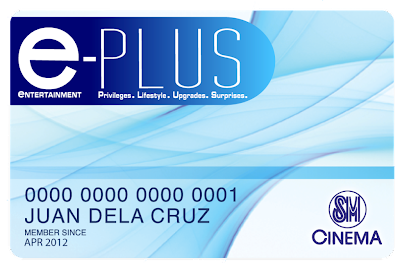 Once completed, submit the form and pay a fee of Php300.00 to immediately received your personalized e-PLUS card with an e-PLUS Starter Kit. This kit contains a movie pass, a meal (one large popcorn and soda) and an “I am a Movieholic” premium item. As a bonus for being a new member, after completion of registration form and authentication of mobile number, member also gets a complimentary ticket for another movie of his or her choice on the next visit to SM Cinema. Isn't that great? Apart from the box office hit “The Avengers”, some of the other exciting movies to look forward are “Battleship, “Dark Shadows” and “Men In Black”. And the convenience is all up for SM Cinema!